Sr. Sue Bruno, OSF, resident director of Fields Hall, has received a 2016 Spirit of Holy Cross Award, given annually to lay collaborators of the Congregation of Holy Cross, United States Province of Priests and Brothers. The award recognizes those who devotedly work to fulfill Blessed Basil Moreau’s vision and mission to “make God known, loved, and served” a reality at the Congregation’s education, parish, and mission apostolates. Sr. Bruno is a member of the Franciscan religious order. 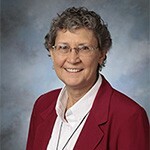 She is in her fifth year at UP as Fields Hall director, and spent 15 years at the University of Notre Dame working in a variety of capacities, including as the rector of Pasquerilla West Hall, in campus ministry, as the women’s basketball team chaplain, and as a member of the Moreau Seminary Formation Board. She also served on the selection committee for the Alliance for Catholic Education for 15 years, and was a founding member of the Standing Committee on Gay and Lesbian Student Needs Committee. Sr. Bruno served in congregational leadership with the Joliet Franciscans for four years. She has a bachelor’s degree in English literature from College of St. Francis, Ill., and a master’s of social work from Loyola University of Chicago. Wayne and Diane Murdy, donors of the new organ in Sacred Heart Basilica (Notre Dame). The Holy Cross community at University of Portland will formally honor Sr. Bruno at a Mass and dinner in January 2017 as part celebrations of Holy Cross founder Blessed Basil Moreau’s life. Honorees will receive a proclamation of gratitude signed by Provincial Superior Fr. Tom O’Hara on behalf of the entire U.S. Province. 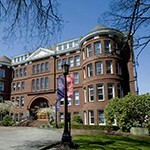 For more information contact the Congregation of Holy Cross at 503.943.8024 or vocation@up.edu. 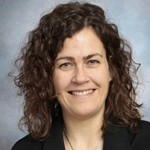 Lauretta Frederking, acting assistant provost and professor of political science, has been appointed as the University’s new Title IX coordinator. Frederking will work with Fr. John Donato, C.S.C., in his capacity as deputy Title IX coordinator for students; Matt Baasten, associate provost, in his position as deputy Title IX coordinator for faculty, and Bill Jenkins, human resources, as deputy Title IX coordinator for staff. Bryn Sopko, departing associate vice president for human resources, will complete all Title IX cases currently open and Frederking will assume responsibility for all new cases effective immediately. Additional information regarding the Title IX process, resources, and contact information can be found at this link. Rev. 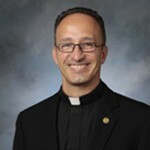 John Donato, C.S.C., has been appointed to a three-year term as Religious Superior for the Holy Cross Community at the University of Portland, effective July 1. He is succeeding Rev. Jeffrey Allison, C.S.C., who served in that position for the past three years. The appointment was made by Rev. Thomas J. O’Hara, C.S.C., Provincial Superior of the Congregation of Holy Cross, United States Province of Priests and Brothers. Fr. Donato will continue in his duties as associate vice president for student development in the Division of Student Affairs. As part of his new position, he is now an ex-officio member of the board of regents. For more information contact Fr. Donato at 8532 or donato@up.edu. Filed Under: 07-06-2015, Campus Services, Congregation of Holy Cross Tagged With: Congregation of Holy Cross, Rev. Jeffrey Allison C.S.C., Rev. John Donato C.S.C. David Houglum has been hired as interim director of the Moreau Center for Service and Leadership, effective September 30, according to Rev. 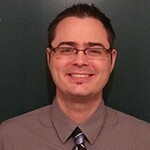 John Donato, C.S.C., student affairs. Houglum has served as a leadership scholar and educator at Loyola Marymount as associate director of student leadership and development in the Ignatian Leadership Institute. Please welcome him to the campus community when he arrives to assume his new duties. For more information contact Donato at 8532 or donato@up.edu. Filed Under: 09-16-2013, Campus Services, Moreau Center, Student Affairs Tagged With: David Hoaglum, Moreau Center, Rev. John Donato C.S.C.